Do you usually have stress organizing your project? Do you struggle to keep your projects, goals, and team members organized? Overcoming these things can be quiet challenging but with the right tool, everything easily falls in line. Trello is one smart tool that can greatly be of help. It is suitable for staying on top of your family, company, and personal projects. It also enables you to sort out your personal tasks in private boards and then call in family members and friends to share information. There are many ways to use Trello. All you need is a few tricks and tips on how to become a pro. Trello is a special web-based project management tool that makes planning, organization, and management of projects easy for people. 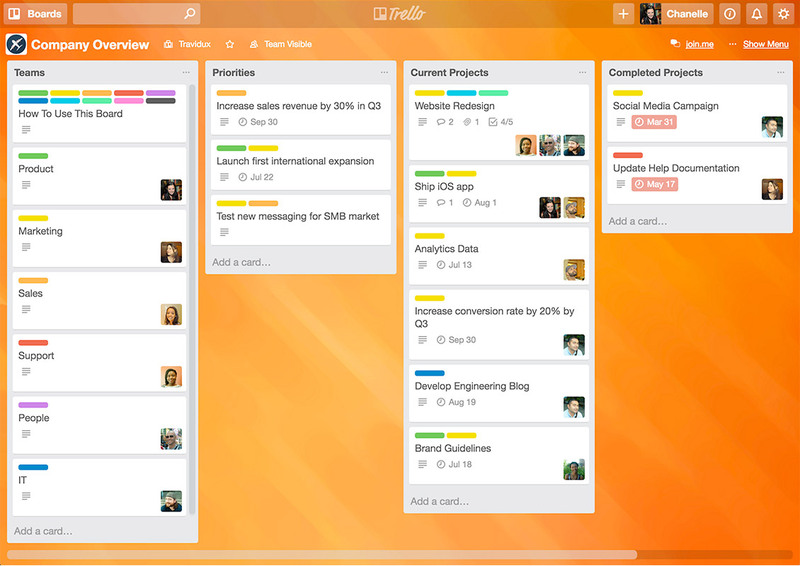 According to Trello, it’s a highly developed collaboration application that enables people to have a visual overview of “what is being worked on, who is working on it, and how far they’ve gotten.” In addition to this, the tool can effortlessly bring people working on various projects together, thereby saving time and promoting efficiency. Being a phenomenal project management tool that helps businesses and individual users to collaborate better and keep their work organized, Trello has many unique features such as Power-Ups, cards, and boards. If you are using an Android device, you can easily get the Trello application from the Google Play Store. However, the tool would request a set of permissions such as Accounts, Network communications (this is required for talking to trello.com), and Sync settings. For iOs users, the app is available on App Store. 1. Create a team space: It is very important to Name the space according to your project’s title. Do not forget to add a description if there is a need for it. 2. Create a board: You need to come up with a new board for each activity within the task. 3. Include the names of your team members to the team space and boards: This is very important as well. You can do this by inviting members through email Trello using Trello signup link or adding people that are already on Trello. 4. Create lists: You can achieve this going to the board, where you can then design lists that will match with the stages of content creation. Maybe, you can start with With Do and then Writing, Visuals, Editing, To Publish, and then Published. During the process, you will ensure each card moves through every list. 5. Divide tasks into cards: Why you need to do this is because it will give you a complete overview of your team’s project. Let one card represent one task and make sure all the tasks are placed in the relevant list. 6. Distribute tasks to team members: You can do this by adding team members to the card or mentioning them in the comments by using“@” along with their username. 7. Set a due date and time: You have to do this on each card so you don’t miss a deadline. While Trello is mainly a free service, it, however, offers three paid options. As you probably know already, the company allows free users to work with an unlimited number of cards, lists, and boards, as well as to add one Power-Up per board. Interestingly, there is no limit on the number of people/members that can collaborate with on the free version of Trello. In fact, users are allowed to roll up files of up 10 megabytes from their Microsoft OneDrive, Box, Google Drive, or Dropbox. 1. Trello Enterprise: This package is ideal for businesses with more extensive needs because it boasts amazing features that are suitable for large companies that often coordinates projects with multiple teams. This package comes with stuff like single sign-on access, features of Trello Business Class as well as extra security components like intrusion detection, file encryption, and two-factor authentication. The cost of the Trello Enterprise is tiered and largely depends on the number of users. You can reach out to the vendor for an exact quote anyway. 2. Trello Gold: This one is specially designed for people who would like to reap the benefits ofTrello’s additional features which include but not limited to customized backgrounds, 250 MB attachments, three Power-Ups per board, saved searches, as well as premium stickers. This plan is priced at $45 per year or $5 per month. File attachments up to 250 Megabytes. Notifications from any device at any time, custom branding with stickers and board background. Exportation of team data with a single click. Integration with a limitless number of applications (via Power-Ups) such as Evernote Slack, Github, Salesforce, and Google Hangouts. Security features such as the ability to delete former employees from an account, moderate membership invitations, regulate who can design private or public boards, and set access to external team members or observer-only for clients. Ability to sort out various options like most members, recently active members or alphabetically. Ability to attach a particular member within a comment and include comments, emoji, or files to a discussion. Most suitable for companies, the business class plan costs $9.99 monthly, per user (if the user decides to pay annually). Before you can delete your board on Trello, you have to close the board first, which is the same thing as archiving a card. To close a Trello board, you have to go to the board menu and select “Close Board” and remember, you have to be an administrator of a board to close it. Now that you have closed the board, you can go ahead to delete it. You can do that by first opening your Closed Boards list. Once you are there, you’ll see a list of all the boards you’ve closed alongside a “Delete” button, which is next to the “Re-Open” button. These buttons are attached to any board that you’re an admin. Simply click on the Delete button and the board will be permanently deleted. 1. If you think you might want to make use of a board someday after closing or archiving it, just leave it in your “Closed Boards” list. 2. Deleting a board on Trello is permanent and once you delete a board, it cannot be retrieved. 1. Basecamp: Basecamp is a Chicago-based web development company which offers a flat fee of $99 in a month irrespective of company size. It boasts features like limitless users and project tracking, a 30-day free trial, a 10% discount for nonprofits, as well as a free account for students and teachers. 2. Asana: Another wonderful web and mobile application, Asana, like Trello, has a freemium package for small teams and individual. Interestingly, this plan comes with a search functionality, basic dashboards, and even accommodates up to 15 users. In addition, it favors projects and conversations as well as unlimited tasks. Asana has two paid plans. They are Enterprise, which includes custom branding and advanced admin controls, advanced security features, and customized onboarding and Premium, which comes with features like task dependencies, advanced search functionality, and custom fields and priority support. While the latter costs each user $9.99 per month, the former’s pricing is not publicly displayed. What this means is that you have to contact their vendor for the exact quote. 3. Jira Software: This product offers a choice of on-premise or cloud-based deployment. It also has three pricing tiers for companies interested in a cloud-based deployment. The monthly subscription price for companies with large teams of 11 to 100 users is $7 per user while firms with a small team of up to 10 users can pay a flat rate of $10 monthly. This software also offers large companies an online calculator for the calculation of their costs. Then firms with interest in on-premise deployment are provided an annual license (Data Center) and a perpetual license (Server). While the cost for the Data Center licensing plan varies depending on the number of users the Server license is a one-time payment that varies based on the number of people using it.